Despite the fact that 43% of voters in NSW are aged 50 and over, there have been few ‘wins’ for older people since the Liberal/National Government came in to power in 2011. Susan Humphries explores the challenges facing government according to Council on the Ageing NSW (COTA NSW), the peak body representing older people in the state. There are almost two and half million people in NSW aged 50-plus who are major contributors to the state. They have a huge positive impact on the economy and of course on the community as a whole. Given this, it is astonishing how little attention is paid to their needs by those seeking election to the NSW state government. Aside from the state government’s commitment to concessions, COTA NSW has not found a great deal to applaud. The government’s Ageing Strategy, released in 2012, has resulted in few significant initiatives. For example, the Ageing Strategy identified ‘linking seniors to information’ as a ‘highlighted’ area for action. However, what we’ve seen since then is a steady decline in the level of useful information offered to older people. The down-grading of the Seniors’ Information Service has been a negative. Older age involves a series of ongoing transitions. The most obvious example of this is the transition from work to retirement. People need access to clear, impartial information about how to manage this period, as it has huge implications on their financial and housing choices. Yet there’s little to assist people at this critical point. For several years COTA NSW has advocated for a government-funded Home Options Advisory Centre, whose purpose would be to assist people to plan and make better decisions about their future housing needs as they age. This initiative has been passed over by successive governments. As a result, in real terms this means that, without adequate information, some people make poorly informed decisions and are at risk of ending up in real poverty as they age. COTA NSW believes that housing is set to become an increasingly thorny issue in NSW. In 2014 COTA NSW undertook a survey of over 2,000 people aged 50 and over in NSW and produced the associated 50+ Report, which found growing levels of housing insecurity among older people. About 20% of survey respondents under 60 paid rent or board, with this figure only falling to 10% after the age of 60. Even at 80, 10% of respondents are paying rent or board in the private rental market. Given that Sydney is one of the most expensive housing markets in the world, older renters are in an extremely parlous situation. Perhaps even more troublesome is the gendered nature of the housing crisis. In our inaugural 2013 Consumer Survey we found that older female respondents were among those most likely to be experiencing financial hardship and, in turn, to be experiencing increased levels of housing insecurity. Alarmingly, our 2014 survey – which looked in far greater detail at the nexus between a person’s socio-economic circumstances and their housing situation –suggests that older women are, particularly if they are single or divorced, living in more precarious circumstances than their male counterparts. Female respondents to the 2014 survey were over-represented in the lowest income group, with more than 25% indicating they received an income less than $25,000 per annum. Similarly, women in our sample worked longer than men and had less superannuation. Disturbingly, these results are found amongst a group of respondents who are highly educated relative to the general population. While it is alarming, in and of itself, that there is a growing population of older women who are experiencing significant financial disadvantage and precarious housing situations, it is crucial to note that older women are the ‘canaries in the mine’. As patterns of home ownership shift, increasing numbers of older people are reaching older age without the prospect of ever owning a home. While female respondents to our survey are emerging as a particularly vulnerable group, recent unemployment data suggests that older people in general are increasingly finding it difficult to access and retain employment. The Commonwealth Department of Employment recorded a 16% increase in unemployment amongst people over 55 years of age in the 12 months prior to September 2014. Given the level of the current unemployment benefit – which, at $258 per week is $130 per week less than the age pension – it is difficult to see how this population will be able to access secure or satisfactory housing, particularly in the years where they await eligibility for the age pension, which will be set at 70 by 2035. Urgent action is needed to address these mounting problems, or we risk seeing the rise of an elderly underclass. At the close of 2014, COTA NSW submitted its Pre Budget Submission (PBS) to the Baird Government. Our key policy document, the PBS makes a series of recommendations about areas where policy action – and the associated budgetary allocations – should be made. 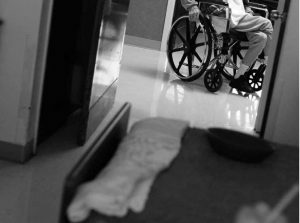 Above all, COTA NSW called on the government to develop a strategy to devise affordable housing options for older people in general, and older single women in particular. We want to see action to drive change in the private housing market, so that a wider range of high-quality, secure, affordable housing options are created, including boarding houses, residential parks and retirement villages. We want the government to work with the community housing sector to develop and deliver innovative models that can provide affordable rental accommodation to women who are ageing, who do not own their own home, and who are living on low to moderate incomes. COTA NSW is also calling for action on social housing, with older people made a priority. It seems to be business as usual for the major parties, with both sides of the political divide seemingly content to leave older people seen but not heard. Naturally, we urge all major parties in government or opposition to demonstrate their commitment to these policy areas. COTA NSW encourages all voters to visit the websites of the political parties running candidates in their electorates to assess their commitment to older voters. We also urge whoever is elected to face up to the challenges facing older Australians.